Last weekend the Langley Weavers and Spinners Guild spent time at the Bradner Flower Show doing a sheep-to-shawl demonstration. The fibre we used was actually alpaca, but that doesn’t have the same alliteration as sheep-to-shawl, and the idea is the same. A sheep-to-shawl is a popular competitive event amongst spinning and weaving guilds. Yes, competitive. You have a clearly defined team, four spinners, one plyer, a weaver and an interpreter. The interpreter is the person who speaks for the team, answers questions and helps the general public understand what’s going on. 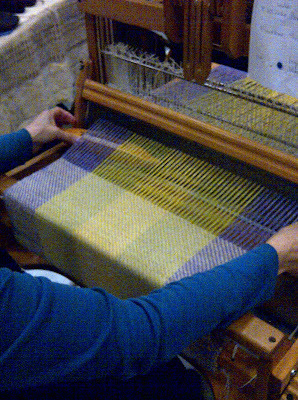 The loom is warped ahead of time, but the fibre, while washed, is unprocessed. The task of the team is to card, spin, ply and weave the yarn into a lovely fabric: a shawl. The team scores points for completing their shawl within the timeframe, usually 4 1/2 to 5 hours. The also get (or lose)points for the quality of the yarn, the complexity of the weave pattern and the finishing. We didn’t want to be part of a competetion, but thought that this kind of event would be just the match for the Bradner Flower Show. Here’s a photo essay of the various aspects of the sheep (alpaca)-to-shawl event. Below is stage one: after the shearing that is. This is the carding phase. This is where we take the fibre shorn from the lovely alpaca, see her photo there? 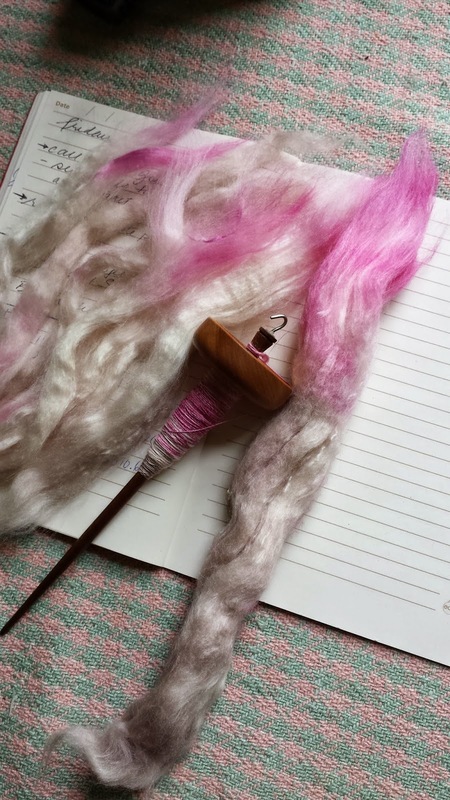 and card it into fluffy, manageable batts for spinning singles. 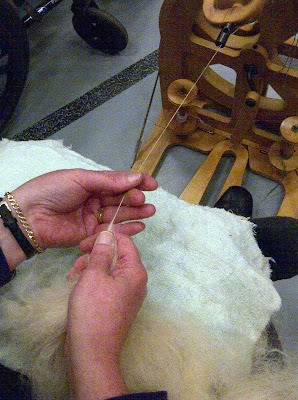 This next photo is a shot of one of our guild members spinning the alpaca into a fine single. The weave pattern for the shawl is a twill pattern with different coloured warp threads, so we wanted the warp and weft yarns to match. Near her wrist you can see the lovely fluffy, carded fibre. This is the plying stage. We take two bobbing of freshly spun singles and ply them into a balanced 2-ply yarn that we can weave with right away. 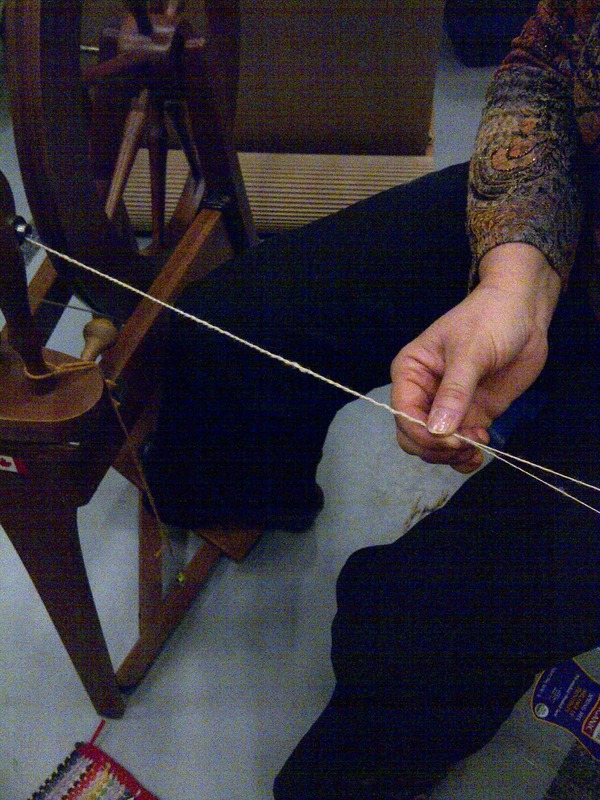 After this is done, the yarn is loaded onto the weaving bobbins and handed to the weaver. And the weaver weaves. 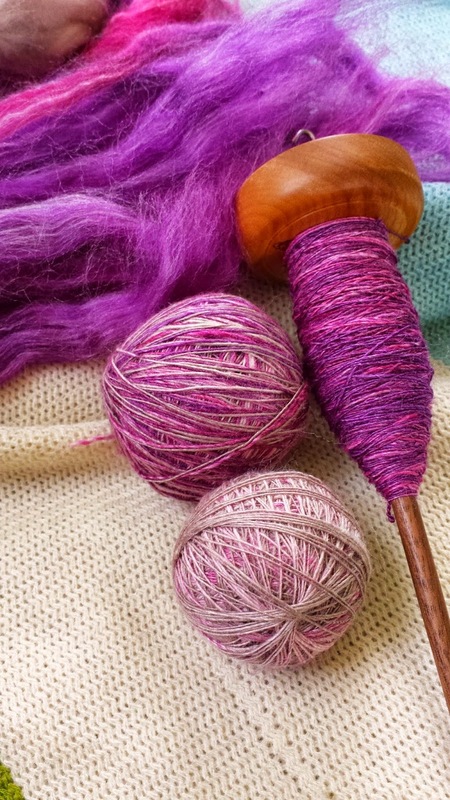 The cream coloured alpaca matches wonderfully with the purple, green and yellow of the warp yarns. Making for a wonderful, springtime shawl. We finished this shawl on day 2 of the flower show and started on a second one. The second one has a slightly different weave pattern — still using the twill idea, it is a zig-zag twill. I am sure there is a better name for that pattern, but I’m not a weaver (yet) so I have to name them as I see them. After it’s taken off the loom, it will be washed and fulled and the fringe will be twisted. The completed shawl will be actioned off at the Beyond Fibre — Annual Artisan’s Sale that the Langley Weaver’s and Spinner’s Guild hosts every year. This year it’s taking place on Saturday, November 3rd and Sunday, November 4th at the Community Hall on Glover Street in Fort Langley BC. Hope to see you there. This entry was posted in alpaca, Bradner Flower Show, plying, spinning, weaving on April 22, 2012 by DianaTwiss. A couple of weeks ago I took some dirty fibre, put it into a lingerie bag and threw it into a bucket of ice cold rain water for over a week. The day I removed it I had to break the slim layer of ice that had formed around it. The water, while dirty at the beginning, was replenished daily from the deluges we’ve been having, so at the end, it was rather clean. I was going to leave it for several weeks, but it seemed so clean already, I got impatient with my own experiment. So, I took the bag of fibre and tossed it onto the garden for the rest of the week. 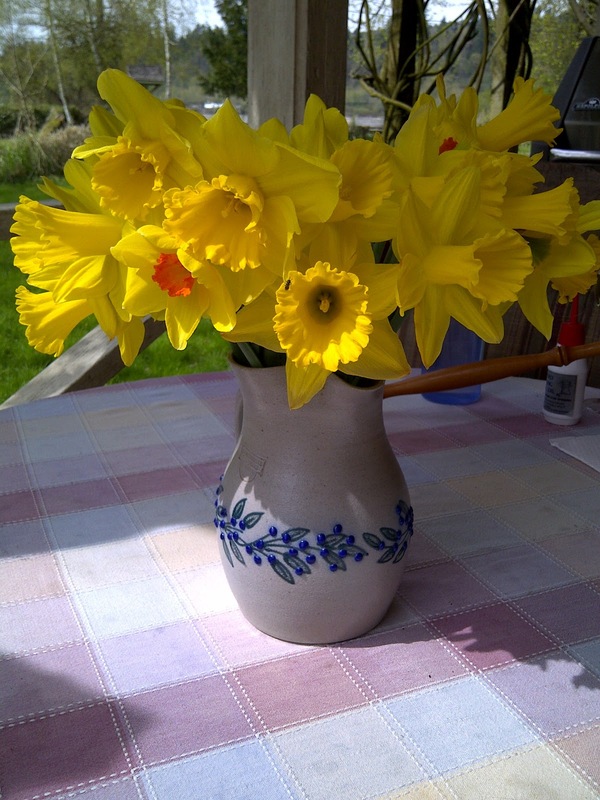 Over the week, as we had bouts of rain and sunshine, it got soaked and dried out repeatedly. A couple of days ago I retrieved it, towel dried it and put it by the stove to really dry. I am absolutely amazed how clean this fibre is. There is no dirt in it at all, and only a trace amount of lanolin. Here is a photo of it. Bottom corner are the clean locks, at the top is a combed nest, and along the side is a hand carded rolag from the combed waste. Here’s the whole lot of the experiment, combed up and waiting to be spun. 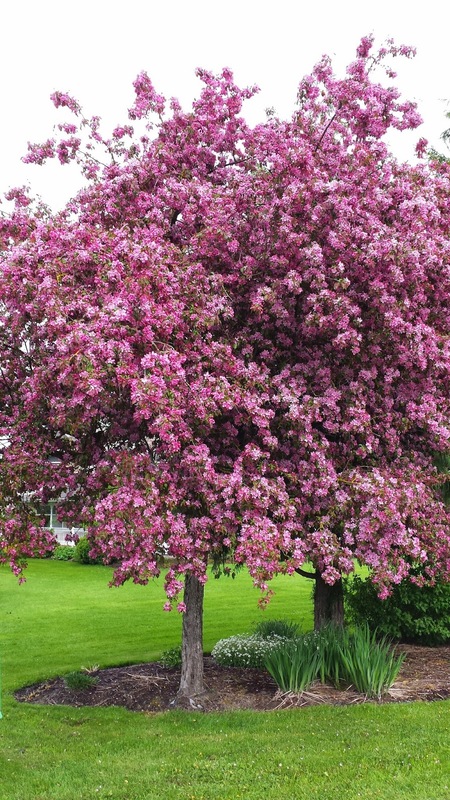 It’s beautiful stuff — not damaged or affected at all by super hot water or harsh chemicals. While it was easy to spin, the trick was keeping it warm. When the fibre was cold, the lanolin was a bit sticky. It’s generally chilly in this semi-insulated farmhouse, so I kept the fibre waiting to be spun, on the warming stove in our front room. 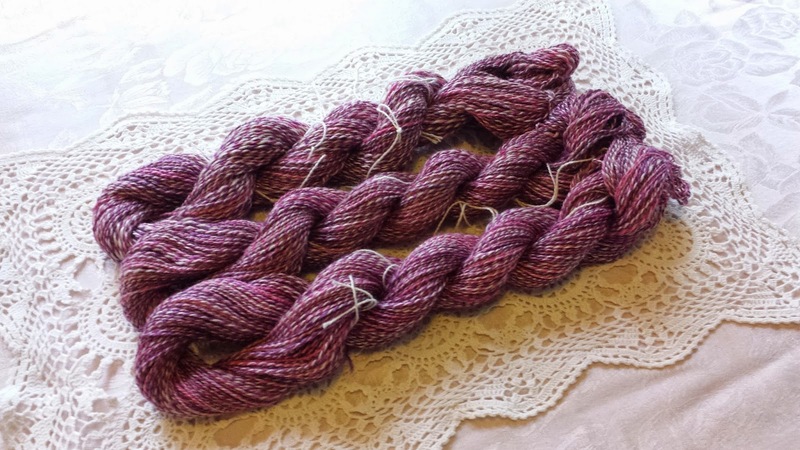 Here’s a double-ply skein which weighs 14.5g and is 58 m long. Pretty good sized sample to play around with I’d say. Because the wool fibres are stretched so much during spinning and plying, it’s good practice to wash or at least wet the fibre after it’s been skeined. This way it returns to it’s regular size and shape, reducing the risk of surprises the first time you wash a garment made with hand spun yarn. 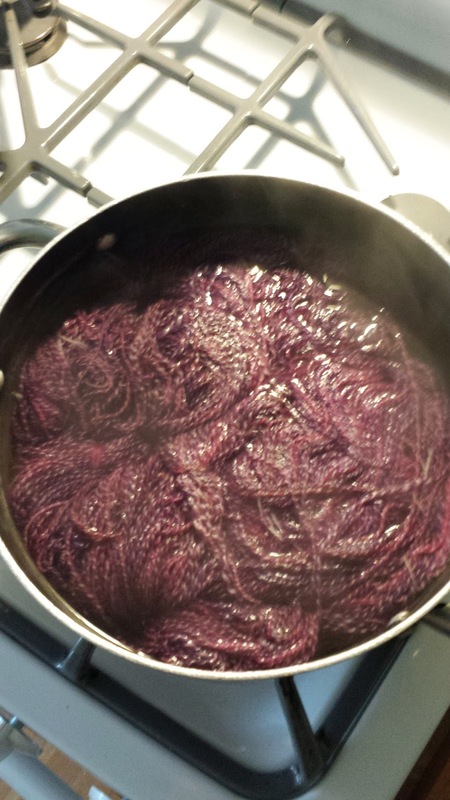 I didn’t want to remove any of the lanolin from this yarn, so I’ve wet it again in rain water. The stuff is ice cold, so I brought a bucket of it into the house, where it may at least get to room temperature in several hours. 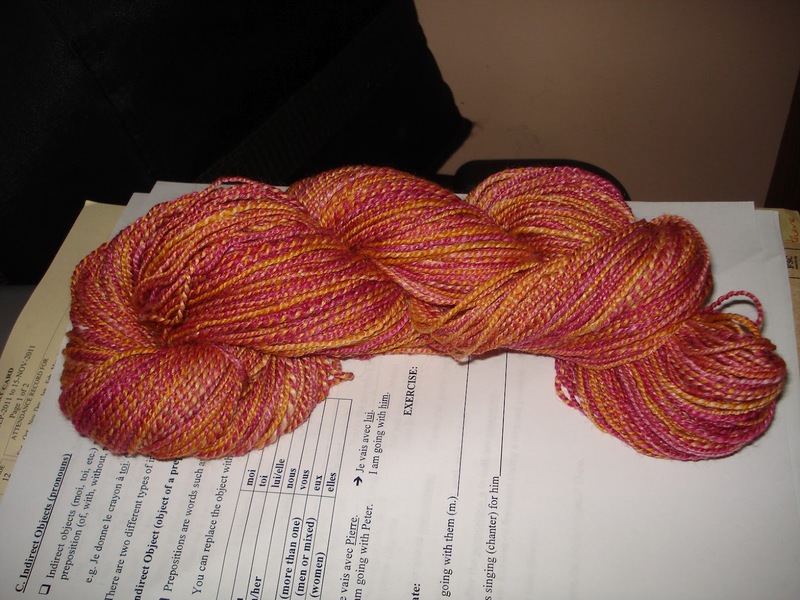 Here’s my lovely skein soaking. I’ll let it do this for a few hours, to make sure the fibres get good and wet and then I’ll hang it to dry. I can’t wait to knit this up and see what it’s like. 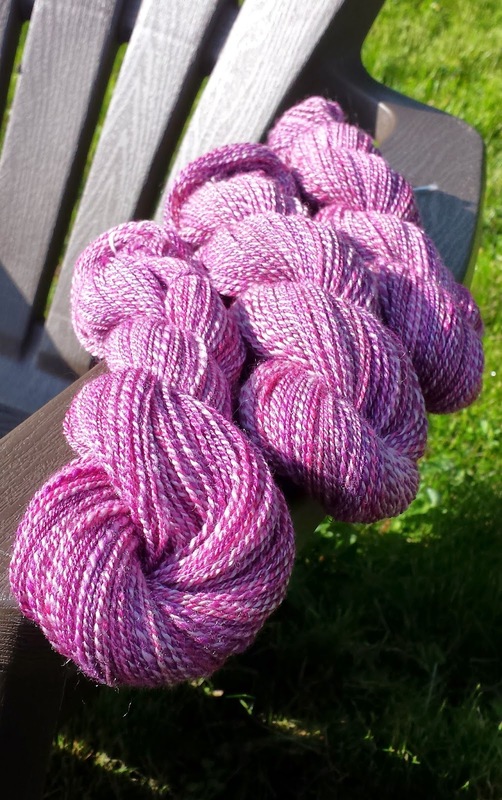 Imagine, this beautiful yarn from fibre made clean with rain water and time, plenty of time. 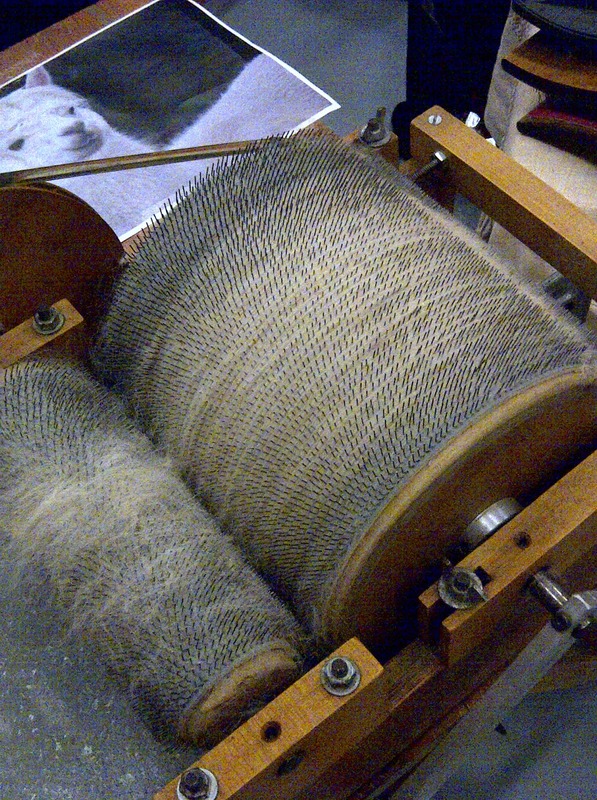 This entry was posted in cheviot, handspun yarn, local fibre, plying, scouring wool, spinning, wool on March 10, 2012 by DianaTwiss. I finally made a decision about this yarn. It’s been sitting on the bobbin fully plied for well over a week. In fact I wanted it to be thought it was over plied, waiting to be plied again into a cabled yarn. However, I forgot that I over plied the first singles (because I had a particular plan in mind) so when I plied them together, what I thought was over plying was just making a good balanced yarn. And that’s what you see here. The problem was I jumped plans. For a cabled yarn, I should have a put a gentle amount of twist into the fist singles; then take the singles and overply them — which means putting much more twist into your plying than you normally would; and then cable them (ply them again moving in the opposite direction) with a regular amount of twist. This under twist; over twist; under twist, will result in a soft cabled yarn. I started with the experiement of putting a lot of twist into the singles, then let the project sit for a long time. I decided when I looked at the colours, that I wanted to try a cabled yarn with it — forgetting the severe amount of twist I put into the singles. There was so much twist needed in the first ply, that when I tried to make a cabled yarn, it was as hard as a cable. Not the effect I wanted at all. I hope this all isn’t terribly confusing. So let me synthesize it — I started with a plan, and I needed to stick with that plan. I jumped into another plan halfway, and what I did in step 1, really did matter. It’s a nice yarn with good colourways. With a lot of twist in it and, balanced like it is, it will make a very good sock yarn. It’s not a disaster, at all. But I still don’t have a cabled yarn. This entry was posted in cabled yarn, handspun yarn, plying, spinning, Sweet Georgia Yarns, wool, yarn on March 4, 2012 by DianaTwiss.